I would call it more an obsession than a passion, and it began as a child when I couldn't cope without regular intervals of chocolate. I realised this had to stop, so I aimed my consumption of chocolate to be focussed towards the creation process and worked as a chocolatier for a while before embarking on several other adventures, leading to training as a pastry chef in Paris and working under the command of top pastry chefs such as Christophe Michalak and Jean Marie Hiblot at the prestigious Hotel Plaza Athenee. I started up Le Choux last year when I realised I could not find a decent chocolate eclair at close proximity in London. During my time doing research and development, I fed my family copious amounts of choux before starting up a weekend market stall in Old Spitalfields market, with help from my pastry chef friend Julien and my sister Sarah. After a year, you can now find our choux in the prestigious Fortnum and Masons, various market stalls around London with Kerb and Partridges, or have them delivered directly to your home or office. Anyone who has ever made choux pastry knows that it only lasts a day or two. 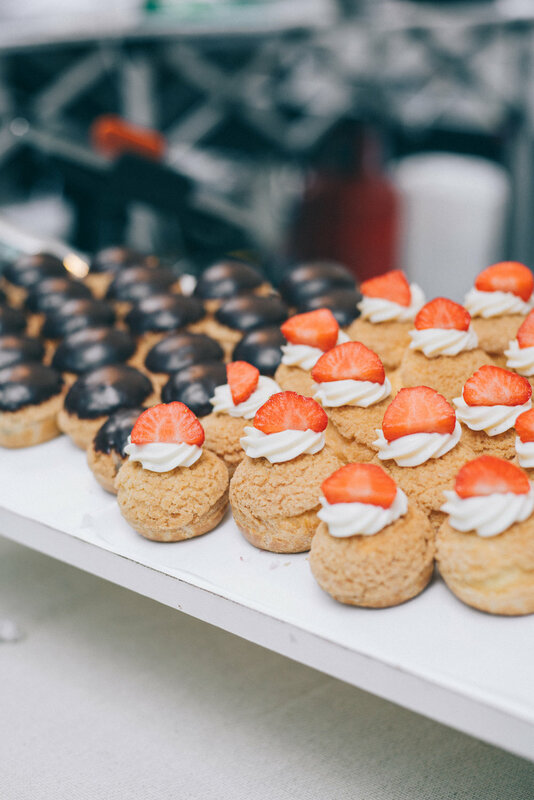 Our choux are made fresh, with focus on quality and taste. We aim to cut down on the sugar content, not because we are trying to be healthy (far from!) but simply because we don't believe that adding lots of sugar helps the flavour of the choux. We use ethically sourced dairy from the Estate Dairy, full fat milk and double Jersey cream. We mix our choux pastry with good quality, organic flour by Doves Farm. We crack large, free range eggs by The Good Egg Fellas before hand piping our choux one by one. Once baked, we fill them one by one with our cream fillings made with high quality chocolate, coffee, dark salted caramels, Madagascan vanilla pods, fresh fruit and nuts. We stay away from any unnatural preservatives, colourings and gelatine. Our aim is to bring a little bit of Italy and France to London. In Italy and France, you can find a patisserie on every street corner to go with your coffee and we wish London to be a little more like that. Sign up with your email address to receive news and regular updates.